Past radio becomes so much vapor as those who tuned in go a same way. Have oral history projects gathered memory of what listening was like? A name like Chandu escapes recognition today, as does The Shadow or Mandrake, or … what other heroes of departed youth? Pulps, serials, few surviving broadcasts, can reclaim them, but these are bare remnant of weekly (some daily) crackling over air that’s said to have thrilled more satisfactorily than TV that took radio’s place. 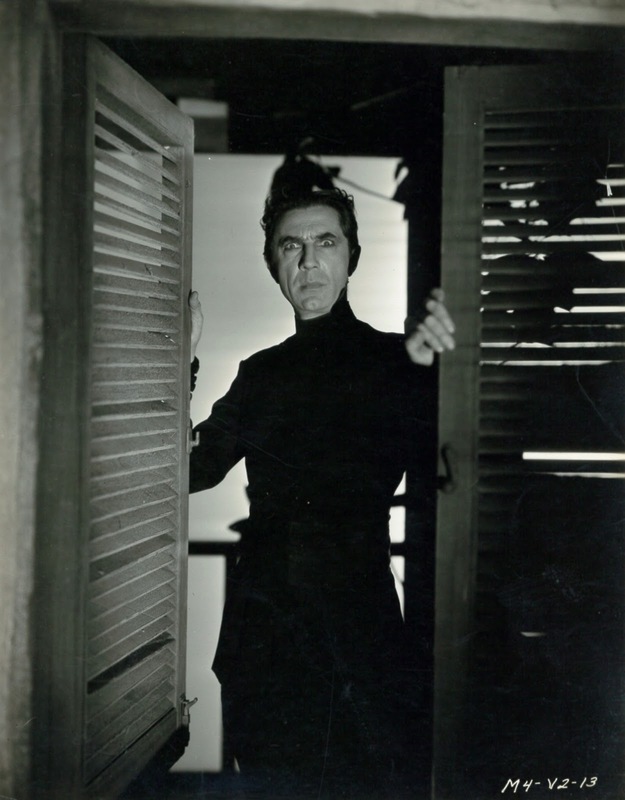 I’d not have known or cared for Chandu but for Bela Lugosi opposing the character in one feature, then becoming him in a follow-up chapter-play. 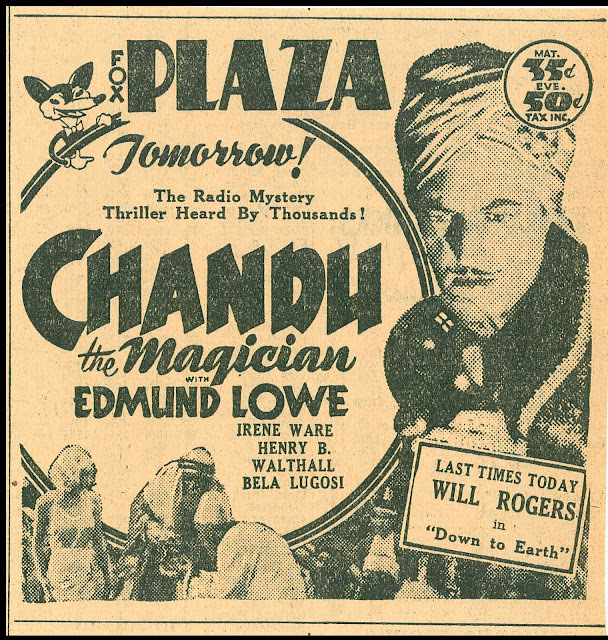 Serials being as antique a format as radio, we'd not have access to Return Of Chandu until PD video began spitting it out, while Chandu The Magician, buried among Fox-fare, seemed as likely to turn up as London After Midnight. Meanwhile, it was old men of decreasing number who’d recall Chandu as recurring figure, us having to take their word, plus evidence of wireless schedules, that the character once had a vital role in shaping of youth. I played a couple Chandu radio episodes online, same storyline (coincidence? There were over 50 episodes) that inspired Fox’s movie adapt, but OTR still is not ingrained habit here, though I’d be well served for more time spent in that Theatre Of The Imagination. Speaking of imagination, I’ve read of listeners doing mind-picture of events as they occurred on radio, self-generating people and places on wings of voice/fx heard. Sort of like silent movies to which we had to give fuller attention. So did radio and pre-speech films breed a generation of writers better able to express themselves creatively? Lots of pop culture still extant was given birth by artists raised on radio. The Chandu episode I heard needed work and concentration to fully enjoy. Maybe the real reason I don’t hear more OTR is life spent at idiot-proof intake of amusement. I’ve wondered how much is left of the old movie enthusiasm --- shouldn’t we ask too how many still revere radio? There are conclaves yet that meet, recreate old broadcasts, and talk undoubtedly of Chandu. For others of us, there is Kino’s Blu-Ray release of the 1932 Fox pic, which has plenty to engage even if you care less re the title Magician. I remember vividly as a 6 year old in Minto, New Brunswick listening to The Adventures Of Tarzan on the radio. That's the only one I can recall. MANDRAKE is still alive in the comics. The strip is well written. It's interesting that Edmund Lowe is highlighted in the ads as Chandu when today the only reason I, and many, probably most, others will watch it for Bela Lugosi who is delicious in the role. I have the best restored version of the serial (and that is still not saying much for it). The TARZAN episode I most vividly remember was one which ended with Tarzan about to get his head cut off. The next day we went to a Saturday matinee where the cartoon featured characters loosing their heads, a Three Stooges film in which they lost their heads and a feature that scared me so much (at 6) I left the theater. Years later when I ran ABBOTT AND COSTELLO MEET FRANKENSTEIN I realized it was the feature. It was the scene where Lou sits in the chair with the Frankenstein monster. Radio drama is alive, but it's hard to say if it's well. Audiences are dwindling, especially audiences willing to support the release of additional uncirculated programs financially. Most seem completely fine with whatever they can get for free online in whatever sound quality is most readily available. It's akin to passing up a Criterion Blu-ray because you have a 30 year old VHS tape that you picked up at Goodwill. That said, there are still some of us who gather at a couple of annual events a year, with whomever is left that was a cast member of those old shows, small collectives hanging onto any word of what it was like to actually work in a medium that touches us so much. I love radio. I listen for 2+ hours a day. But I don't have much of an affinity for the new crop of radio drama (podcasting seems to have given people the impression that telling stories aurally is a new concept). Some of it is okay, but by and large, it feels like the style of radio acting that was done 50-75 years ago no longer exists. TCM is running the Mandrake serial right now on Saturday mornings. It is tough sledding! Mostly fistfights amongst stuntmen. Mandrake himself is dumber than a stump. 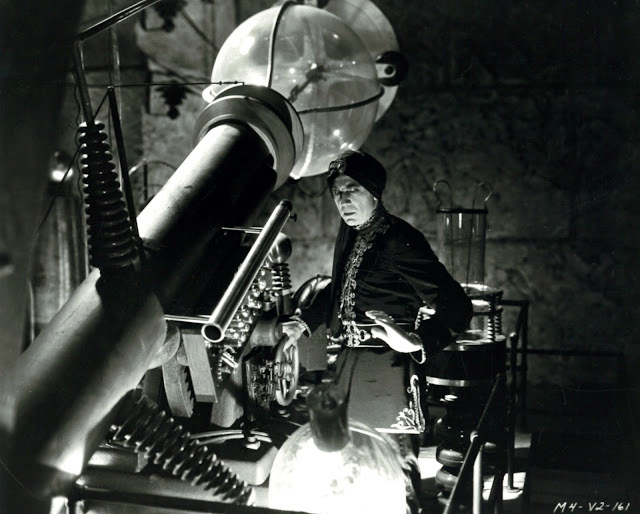 I remember back in the seventies watching the Lugosi Chandu as a feature on a snowy UHF station. I do enjoying the Dragnet, Gunsmoke, Hoppys and similar fare on the Sirius Radio Classic channel. I like the Mandrake serial, but I have a fairly high threshold when it comes to serials. I always revert to a 10 year old boy when watching. John, the answer to your question as to whether Radio fostered a generation of creative folk with well-exercised imaginations is a definite yes, it was the last media our “civilization” created that made one use one’s brains rather than do all it can to turn them off (I never thought that anything could top television for mind-numbing capacity until the internet was spawned). Sure there was a lot of crap on radio too, but if you want to know just how brilliant the medium can be in making the mind create milieu more incredible than any director or art director could create, I recommend any of Orson Welles Mercury Theaters or Campbell Playhouses (one cannot really understand just how brilliant or creative Welles was unless they have examined his radio work, the one media in which he was a complete success both financially and creatively) , or some episodes of Carlton E. Morse’s I LOVE A MYSTERY (listen to TEMPLE OF THE VAMPIRES some time). I always considered myself fortunate to have been able to immerse myself in all the various creative media: film, radio, literature, music, theater, and just enough television until it started heading for truly stupid (we consider the cut-off line when color came to all the networks full time in the late 60’s, when color came to all television is when it really began to get colorless). Each one of these forms stimulates different parts of my mind, and keeps it working, and one always appreciates radio and/or creative audio anytime one is driving on a long road trip or working at something menial or repetitive that only requires a small part of one’s brain to operate and requires something to keep the rest of it entertained (data input anyone?). And speaking of CHANDU, I’ll put in a good word for Edmund Lowe, I’ve always found him an interesting actor in the moustached leading man vein, he can be witty and urbane, and does just fine as a detective, and can even supply a bit of the mystical when required, he just fine in CHANDU, and even better as the magician in what was basically the William Cameron Menzies Fox run-up to CHANDU titled THE SPIDER (1931). Lugosi is fine in the Sol Lesser serial, but Chandu is really supposed to be an American who had studied mysticism and magic in the Orient, and Lowe is a good approximation of the character as Gayne Whitman played him in the radio serial, Lugosi is so much more fun as Roxor in the Fox feature. The thing about old radio I love is the chance to listen to some musical performances that otherwise would be impossible. This one is a very rare opportunity to listen to Carlos Di Sarli and his orchestra live in 1957, when he received an award and homage from RCA Victor for his 25 years with the company (they were actually 29 at that time, although a few months later they had a terrible split)... since the acetates were incomplete, I had to complete them myself. John, do yourself a favor and listen to the series "Quiet Please" -- the best radio show, outside of Jack Benny, I've ever heard. The episode entitled "The Thing on the Fourble Board" is legendary. And if you want a sample of how not all radio was great, try "Orson Welles' Almanac", where the great man tries, and fails, to ape the Jack Benny format. Almost worth it to hear Agnes Moorehead as his smartmouth secretary, and Ray Collins reading the Mobil commercials! I'm a huge fan of old radio., and listen to 1-2 hours a day on average. I was born in 1970, so it's not nostalgia. There is enough interest out there to keep alive a couple of commercial interests selling high quality shows, or shows licensed from the current copyright holders (Radio Archives, Radio Spirits), plus of course there is loads of free stuff available. There is a dwindling number of people who remember radio in its prime, but there is still interest from younger listeners. (I.e, millennials and post-millennials). That said, it remains (and always will) a niche hobby. Its heyday is long gone, and there simply isn't the corps of actors trained in the art of radio drama or comedy -- trained from doing it several hours a day, seven days a week -- available any more. As Rodney notes, the modern stuff just isn't the same. It's like someone making a fan film in black and white now, and expecting it to look like a Warner Bros or Universal film circa 1940. QUIET PLEASE is indeed a terrific show, which managed to run on two networks (Mutual and ABC) for two and a half consecutive seasons sustaining yet never landed a sponsor. Wyllis Cooper, who created LIGHTS OUT and was a terrific radio and film writer, created the show for Ernest Chappell, a long-time New York radio announcer and actor (he had been Orson Welles announcer on the CAMPBELL PLAYHOUSE) who told most of the stories from a first-person viewpoint each week. THE THING ON THE FOURBLE BOARD is the most well-known episode, one of the few that were available for listening for years, until Wyllis Cooper widow turned up Cooper’s own transcription discs, sadly in less than perfect condition, and they were made available. There’s not a damn thing wrong with THE ORSON WELLES ALMANAC, its eclectic variety format leaves Welles to do all sorts of interesting pieces on it, even if the comedy bits are no classics. There are great things on the show, including the sketch depicting Texas as a fascist state determined to annex the rest of America (hmmmmm….prophetic), and many great Welles reading of poetry and prose. And it also had the Mercury All-Star Jazz Combination, featuring legendary jazz players like Jimmie Noone, Kid Ory, Mutt Carey and others playing classic dixieland jazz on the radio at a time when it was a forgotten style. Perhaps not the greatest thing Welles did in radio, but like everything he did in radio, entertaining and fascinating. It is surprising how long radio dramas continued on commercial radio in the US. One could still catch Johnny Dollar on radio into the early 1960s. There were also radio versions of the CBS television shows have Gun Will Travel and The Twilight Zone. And in the 1970s CBS presented their Mystery Theater. It appears that radio dramas were just abandoned by the networks, in the same way they stopped doing studio produced television dramas and converted to productions filmed in the studio backlots and soundstages. Radio itself changed block programing where there were different shows each day, to strip programing where the same shows appeared throughout the work week. Usually featuring the cheaper dj hosted music, and later talk shows instead of different drama shows. Meanwhile, in the UK they've continued to produce radio dramas, with new productions being made to this day. Go to the BBC website and you can find a lot being aired on their own channel, BBC4 Extra. which you can check out here..
-- Old radio shows are ideal for tasks that engage the eyes but not so much the mind. An hour of Sgt. Preston makes ironing a lot less grumbly. -- Likewise planes and trains, where you're obliged to just sit. An iPod full of OTR or even NPR is great on a train, because listening and watching scenery in transit complement each other. Reading a book or staring at a device requires those amusements to compete with scenery. -- If you're driving, comedy and variety are best. There's no important plot to compete with necessary attention to the road, and no great loss if you can't play an uninterrupted episode on a short drive. -- In bed with the lights out would seem to be ideal, but I always doze off. Lights on, prop yourself up, and maybe a snack at hand. Or a book of panel cartoons. Then flop out with the sign off. -- Don't try to fast-forward past commercials. One, discs rarely have tracks dividing up a show. Two, the commercials are a very necessary part of the experience. On the gently upscale sitcom "Halls of Ivy" (Ronald Colman is the dean of a small midwestern college), the beer commercials are hilariously stodgy and respectable. On the Hope and Benny programs, the comedians banter with the pitchmen. -- Used bookstores tend to place OTR discs with the audiobooks; used CD/record stores often keep them in the "spoken word" section near the standup comedy albums. Keep your eyes open, and remember that not all radio shows are packaged in those big plastic clamshells. -- Sherlock Holmes with Rathbone, Bruce, and sometimes Conway: Of course. Especially the ones where the Petri Wine pitchman leads us to Watson's California bungalow, and he and Watson chat during the breaks. Later editions with different cast are okay, but not as epic. -- BBC Sherlock Holmes: A superb dramatization of ALL the Doyle stories, starring Clive Merrison and Michael Williams. Judi Dench (Mrs. Williams) does one guest shot as Mrs. Hudson. These demand closer than usual listening; the writing is almost cinematic and transitions are subtle. But worth the time and attention. -- Duffy's Tavern: Really broad sitcom, often with a guest star showing up to banter with Archie the manager. Some of the characters sound instantly familiar: they were (and are) imitated in countless cartoons. -- Halls of Ivy: Low key and sentimental, with Ronald Colman and Benita Hume (Mrs. Colman). Frequent flashbacks to Colman, a midwestern (!) professor, meeting and courting glamorous star Hume during a sabbatical in England. -- The Shadow: Mandatory. The show ran so long that naturally some episodes are far better than others. Now and again it gets truly mad: A crazed artist who likes his models dead; a girl and her father who BOTH think she's a werewolf; etc. -- Jack Benny: What's interesting is the big laughs from insults to the egotistical Benny. On TV we could see Benny's beautiful takes, but on radio he can only say something like "Now cut that out! ", usually followed by a straight line that allows the other character to score another laugh. -- Bob Hope: A lot of deliberately dumb gags and interesting topical jokes; the monologues sound like Johnny Carson with quips about gags that flop. And lots of broadcasts from military bases, through the war and after. Found a set of 20 CDs for a buck and worked through them all. As an Army brat growing up in Germany in the sixties, and not having access to American television I was lucky enough to hear some of the later radio broadcasts of the fifties, such as Gunsmoke (with William Conrad) Suspense, and Your's Truly, Johnny Dollar on American Forces Radio.There is an out of print book, "The Big Broadcast" by Frank Buxton and Bill Owen that is an encyclopedia of radio broadcasts from 1920-1950.Some of the most creative writing in any medium was done during the golden age of radio. Many current writers still mine those old shows for ideas. Abe Burrows, one of the authors of the play "Guys and Dolls" wrote for a very popular radio situation comedy,"Duffy's Tavern." His son, James Burrow's took some of the ideas from that radio show and helped create the T.V. show "Cheers". One of the oft-repeated taglines on "Duffy's Tavern" was the bartender answered the phone with "Duffy's Tavern, where the elite meet to eat." This is referenced on the animated T'V. show "The Simpsons" whenever Moe answers the phone, "Moe's Tavern where the elite meet to drink." Johnny Carson's "Mighty Carson Art Players" was inspired by "Fred Allen's Mighty Art Players" from his radio show. I am perhaps as enthusiastic about the golden age of radio as the author of this blog is about movies. Reading the comments on this post, I realize there are many other readers of this blog who are still being entertained by these radio shows.